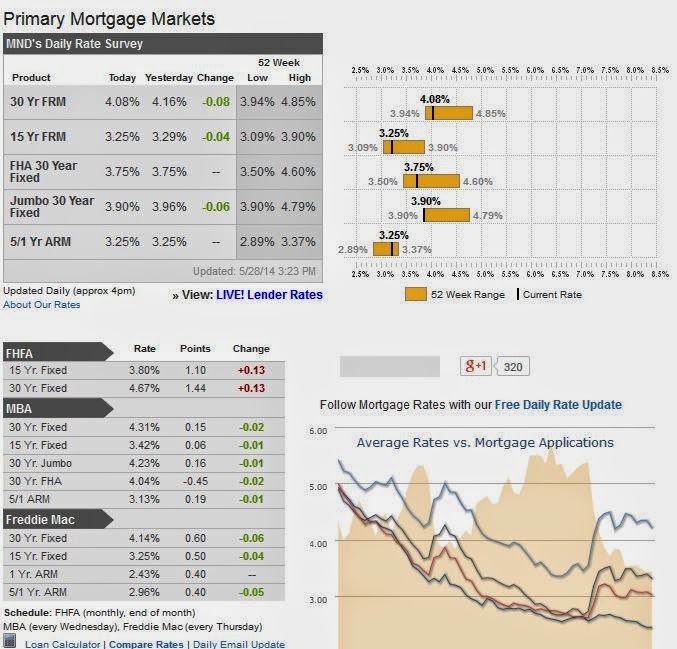 After tying the record for most consecutive days with no change, mortgage rates moved significantly lower today. The significance isn't due to the size of the move--as far as day to day changes go, there have been bigger. Rather, the impressive part of today's rally is that it occurred while rates were already effectively at the lowest levels in 11 months, further extending an already strong move lower over the past two months. Through yesterday, rates had been giving the impression that the string of recent improvements was leveling-off and waiting for more important information on the horizon. In that context, today was an utter blindside. It wouldn't have been as surprising if rates merely began drifting lower ahead of those key events. They sometimes do that after leveling-off in such a manner, but today was anything but a drift. The most prevalently quoted conforming 30yr fixed rate for best-case scenarios (best-execution) is already close to 4.0%. Some lenders are there already while others are offering substantially lower costs at 4.125%. After today's move, few lenders remain competitively-priced at 4.25%. For imperfect loan files, however, 4.25% is still a sweet-spot in terms of up-front cost vs contract interest rate. While today's drop in rates is encouraging, markets will now be more sensitive to data and events that suggest a move in the other direction (such as a stronger-than-expected GDP revision tomorrow). Despite that sensitivity, the first move higher in rate after this rally runs its course isn't likely to be the biggest one. That affords some decision-making time to those inclined to float (but who also accept that they might be faced with the decision to lock at slightly higher rates than the previous day.